The Bengals are a smart bet in Week 7. What is the line telling you: The oddsmakers and offshore books opened with the Eagles minus 4.5 and total at 45 over Cam Newton and the Panthers. We saw some early movement in the market with the Eagles dipping to minus-3.5 on Tuesday, before we saw an influx of money attack the screen and forced the number up where it currently sits with the Birds being a 5-point favorite. The total is 45 almost everywhere, from offshore to Vegas. The early results are showing 60% of all tickets placed on Philadelphia, while the bigger wagers and overall money placed has been on the Panthers. The smart money says the Eagles may be smelling themselves a little bit off their win over a real bad Giants team, which has the worst pass rush in the NFL. Jalen Mills is having hamstring problems, and he’s the Eagles’ best corner in the red zone. When we look at the overall offensive metrics, the Panthers actually rank six spots higher than the Eagles in yards/per play (5.7 to 5.3). If the number reaches 6, take the Panthers plus-6. Bottom line: The smart money likes the over 45. What is the line telling you: Pinnacle, the greatest sports book in the world, opened with the Lions being a 2.5 road favorite. Since then, we’ve seen a slight adjustment on the side. Right now, Detroit is a 3-point road favorite. The early market reports show 55 percent of the tickets being laid on the home Dolphins. That will rise by kickoff. The Dolphins are coming off an outright win over Chicago as a 7-point underdog. Now they’re catching plus-3 points at home against a Detroit team that’s 2-3 with a minus 12-point differential. To be honest, the bookmakers are begging you to take the bait and bet Miami. The sharp money loves the well-rested Lions team coming off a bye. Also a fact: road teams coming off a bye have covered the spread 69 percent of the time. Bottom line: The smart money likes the Lions minus-2.5 to 3. What is the line telling you: The AFC North first-place 4-2 Bengals travel to Kansas City against a team some experts are calling one of the greatest offenses of all-time. Oddsmakers and offshore books opened with the Chiefs being 5-point favorites on Monday night, with a combined total set at 58.5. Since then, we’ve seen the number bounce around from the dead number of 5 to as high as Kansas City minus-6. We’ve also seen the total drop slightly here. The offshore markets and in the desert are showing all tickets being placed on the Chiefs, which makes perfect sense, since Kansas City is 6-0 against the closing number and 5-1 against the opening Vegas spread. The sharp money is being patient here, waiting for some books to make the number 7 for the Chiefs. That’s where the huge money is going to bury the Bengals on the 7. 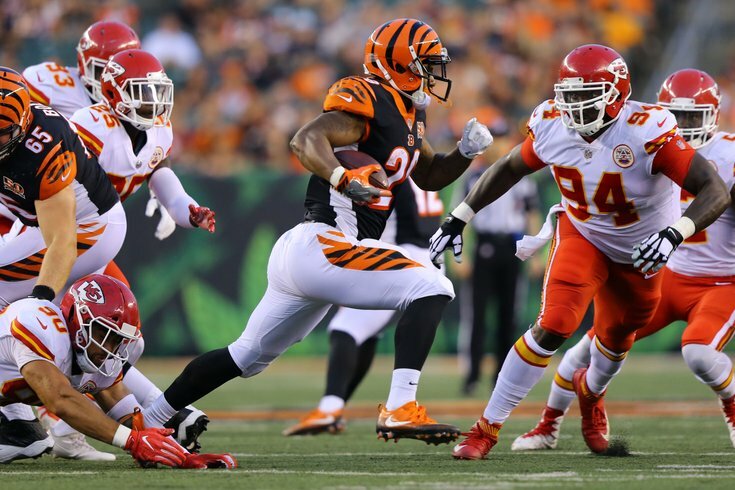 The Chiefs are coming off a short week and an emotional loss, which may keep the Bengals within 7. Bottom line: The smart money likes the Bengals plus-6 small, plus-7 a much bigger bet.